Day six and the kitchen works are still doing. The plasterers arrived at some unearthly hour this morning; painful but it’s good to be getting it all done in one go rather than dragging it out. It’s beginning to look like a kitchen again now although still no sink or cooker. The absence of the sink has been the worst thing; you don’t realise how much you rely on it until it’s not there. We’ve resorted to paper plates to minimise the awkwardness of trying to wash up in a small cloakroom basin. It’s like camping only worse! The studio has been full of kitchen parts, dishwasher and workmen all week so no printing or painting sadly. I have been drawing though; with a collection of small objects (above) which don’t take up much space, I’m pursuing my still life studies. Quick sketches of these four figures which I gathered together in a random but connected way… they seemed to fit well together, similar size and colour. 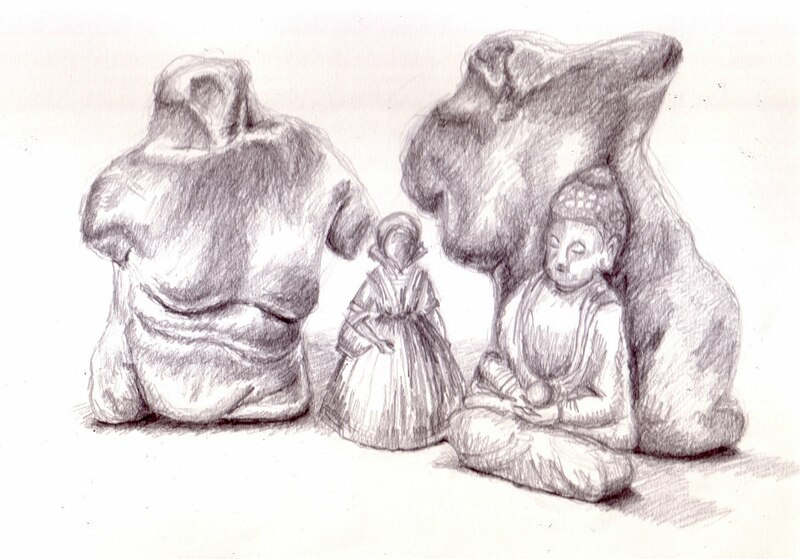 Brass bell, Buddha and bodies. The brass bell has been knocking around since I was a kid – I remember playing with it when I was only just old enough to remember. The jade Buddha figure is a relatively recent acquisition and the two armless, legless, headless torsos I made from FIMO whilst doing A level art at sixth form, too many years ago now. They are quite satisfying shapes to draw and remind me of a fairly pivotal time in my art career. A little paint next I think. At last! The fitters are in and the new kitchen is underway. It’s going to take two weeks to complete because the floors, walls and ceiling need doing too; pipes need fixing, electrics need rewiring, gas supplies need capping. Plasterers, plumbers, electricians, carpenters… it’s a quite a production down there. And also in the studio which is full of new kitchen parts, dishwasher and workmen. I was hoping to be able to continue working in there but that doesn’t look hopeful, at least not for the next few days. I’ve not done too badly with the drawing this week though – drawn four days out of seven. Not a bad start. It’s a bit A level Artish but have been drawing a glass decanter (it was destined for the dump but I decided it might be quite interesting to draw so I liberated it). 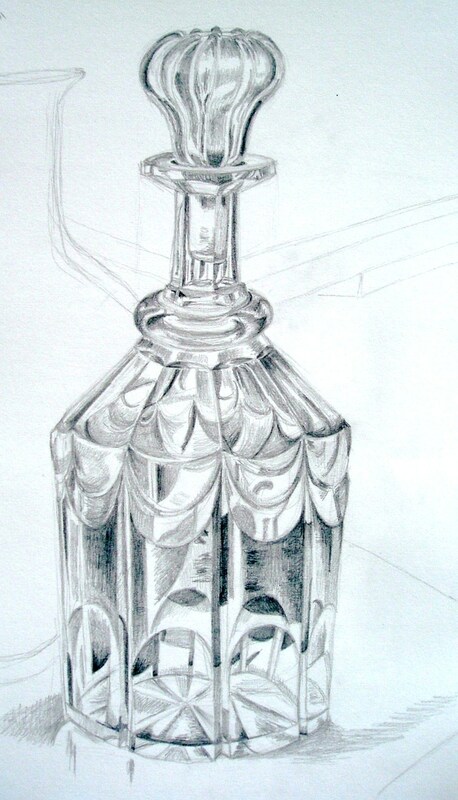 Lots of weird reflections and distortions in the glass which was quite fun to draw. Perspective and proportions a bit wonky in places though. Next step is to have a go at painting it. I’ve never been very interested in still life but it seems sensible to revisit this whilst I’m in Back to Basics mode. And it doesn’t have to be all bowls of fruit and vases of flowers. Some research needed I think. On Friday I attended a private view of the work of local painter Eric Meadus. 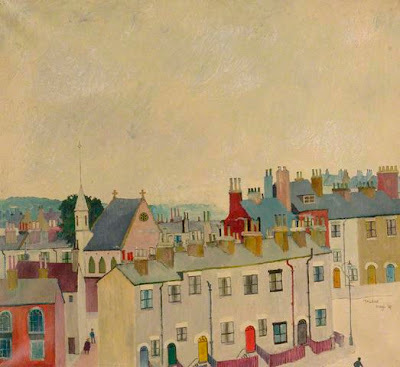 The exhibition at The First Gallery coincides with the naming of a street here in Southampton, Eric Meadus Close. Meadus died in 1970 at the young age of 39 but left behind a huge amount of work. 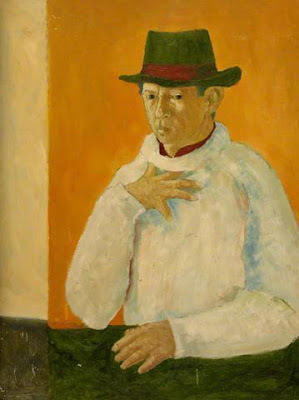 He was self-taught and experimented with a range of styles. Much of his work focused on townscapes; he made many drawings of Southampton’s urban sprawl but it’s a drawing of Swaythling Railway Station which has been used on the commemorative plaque at Eric Meadus Close. For me, the evening was more than just a chance to look at a large number of Meadus’s drawings and paintings. It so happens that the drawing of the railway station belongs to my cousin; he kindly allowed it to be reproduced for the plaque and loaned it, along with another drawing and two paintings, to the gallery for the show. He’s been an avid collector of Meadus’s work since before the artist died. I don’t get to see him and his wife that often so it was most enjoyable to be able to catch up in the civilised surroundings of an art gallery. I’ll probably get shot down for this; my feeling is that Meadus’s work is a bit variable. I don’t think his figurative work is as strong as his townscapes, some of which are quite charming. His drawings of Southampton's urban townscapes are distinctive and spare, the lumpy, little houses arranged all higgledy-piggledy. The locations are recognisable to those familiar with local housing estates – I was particularly taken with a drawing made from the hill at the top of Athelstan Road, looking out over the rooftops, the clusters of houses bisected by the river winding through. Nicely composed. Meadus worked full-time at the now vanished Pirelli General here in Southampton until he died. He would go out sketching in his lunch hour and considered that ‘a day without drawing is a waste’. Judging by the amount of work he produced during his artistic career, he was pretty committed to his art. It made me reflect on my own work and in particular drawing, something I don’t do enough of. I taught a drawing class for Southampton Art Society last evening and heard myself telling my students to practice - draw, draw, draw, anything and everything. It’s the basis of what artists do after all. So, it’s back to basics for me too. I’m off to the studio to practice what I teach. I am painting again. Having dabbled briefly last summer, I put the paint and brushes away and returned to my core business of etching. It’s been a slow year though and I’ve only produced one print I’m happy with. I think I’ve got a bit bogged down with process; the way I work takes so long – which would be okay if I could get regular studio time. Back to basics then. Drawing and painting. Working quickly and loosely with line and colour. The colour bit is particularly challenging as you can see from the work in progress above. My etchings are quite painterly but pretty much monochrome so I’m enjoying playing with colour. And being able to alter the composition more easily.